Don't walk over a fellow player's putting line on the green. For kids just learning the game, however, understanding etiquette is just as important as the fundamentals. And kids can learn the etiquette even before they learn to play. If your golf course allows, bring your child along as a spectator and teach the etiquette as situations arise. Although you should introduce kids to golf with the goal of having fun in the sport, impart the necessary etiquette rules on them from a young age. Don't smother kids with rule after rule, but gently remind them of how the game must be played to respect the course and other players. Coming on too strongly can push kids away from the game, but being lax isn't viable, either. Kids -- especially younger ones -- get excited to be on the golf course. They might yell across the fairway to a parent or run across the green to their ball. Unlike some other sports, golf is a sport that doesn't encourage yelling, especially when people are hitting near you. Occasional cheering following an impressive shot is acceptable, as is yelling "fore" if you hit an errant shot. Some exuberance is bound to happen when a kid succeeds. In general, though, remind the kids to speak in low tones. The dress code is always important in golf, and although every course might have slightly different rules, some rules are universal. In general, wear dress-style shorts or slacks and a collared shirt if you're male. Females should wear pants, shorts or a skirt and a shirt with a collar. Sleeveless shirts are usually OK if they have a collar, but a collarless shirt should have sleeves. Jeans and sweatpants are prohibited at many courses. Teach kids how to dress the part by buying them their own collared golf shirt with the club's logo. Few things are worse than being stuck behind a slow group of golfers, especially if that group is fooling around. Teach your child to be a courteous golfer by being ready to play when it's his turn and to let faster players play through. It's OK for kids to view time on the course as a fun, sociable activity, as long as it doesn't disrupt the pace of the game. The same holds true for you as their teacher. Remember not to spend too long going over the rules and etiquette of the game when people are behind you. Teach your child respect for the golf course. This means that everyone, including kids, must repair ball marks left in the green with a divot tool, rake sand in bunkers after walking through them and replace (or fill in) divots on the fairway and tee boxes. Each time you take your child golfing, remind her to perform these acts. As a child plays more rounds, he'll pick up various etiquette lessons to carry with him throughout his golfing career. 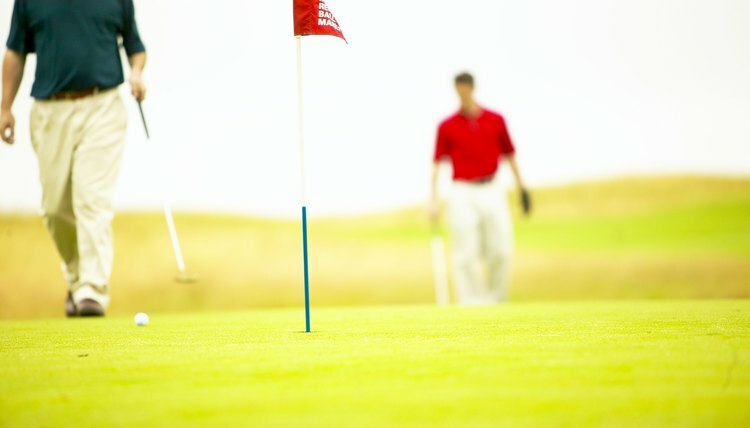 Miscellaneous rules include tending to the flag for other players, not stepping on a putter's line, which is the direct path between his ball and the hole, and knowing the rules. Cheating is a serious offense in golf, even when it's done inadvertently. Tell your young golfer to never be afraid to ask about a ruling.